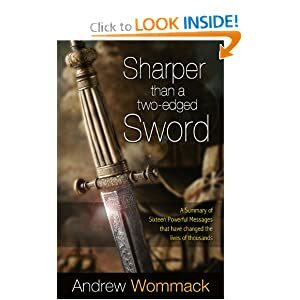 I am going to cover Chapter 5, The Nature of God, from Andrew Wommack’s book Sharper Then A Two-Edged Sword over two weeks, rather then just this week. Once I finished writing it I realized that this post would be too much information to take in at one time. So today we will do questions 1 through 4 of the workbook, and next week we will do questions 5 through 7. I hope that you enjoy this weeks Bible Study. from the Father of lights, with whom is no variableness, neither shadow of turning. Question 1: Can you recall a time in your life when someone got the wrong impression of you? How did it affect your relationship with that person? I would like all of you to think about the question and answer it to yourself. We have all had something like this happen to us at some point in our lives. It leaves us with that sick in your stomach feeling. You want to repair what has been done, but you don’t know how. Sometimes we can be hurt or angry that we have been misunderstood. In similar ways I think this happens with God also. Especially when we are reading the Old Testament. dungeon; and all the firstborn of cattle. You might actually that God is cruel and unfeeling, but this would not be the full picture of God. Question 2: Is the God in the Old Testament different as the God in the New Testament? Did he change? God has always been the same God. He has never changed, we are the only ones who have changed. He has only changed how he deals with us between the Old Testament and the New Testament. Like a child he threatened punishment to teach people, he was acting like a parent acts, he was acting out of love. In the Old Testament God dealt with people under the laws given to Moses, but once Jesus came (God in human form) ( he was born, died on the cross to save us, and rose from the dead to sit in Heaven) God was able to interact with people through the Holy Spirit. He could interact with us directly. Once we were filled with the Holy Spirit, God was able to deal directly with us with Grace and Mercy. God loved us so much that he sent Jesus so that our sins could be forgiven and we could have everlasting life. Under the laws we could never be perfect enough, but through the Grace of Jesus we have received forgiveness. I believe that Psalms 136 really says it all God is good, and his mercy endures forever. What a beautiful gift he has given us. Question 3: What is the difference between the old covenant and the new covenant? The old covenant want the law. People had to be good, that had to fight being evil, and God needed to show them that there were consequences to not following the law. Under the old law people go to heaven by works, but it was impossible to be good enough. We are human beings. We might try our best, but we can not achieve perfection, which left all people separated from God. Under the new covenant, when Jesus died on the cross for us, we received grace for all of our sins. The whole world received grace for their sins. All people for all time received forgiveness for their sins. Once we accept Jesus we are forgiven. That is such a blessing that we were given. When we accept Christ we receive the Holy Spirit, and we are made righteous. That was such good news for mankind. This is the new covenant. The old covenant is below. God did not know us, because we were separated from him by the original sin in Eden. What we can see is that the old covenant and the new covenant are not compatible. You can not be partially saved by your good works and then have Jesus do the rest. Good works will not save you, because we can never be perfect enough, try as we may, we are human beings. We can only be saved through the blood of Jesus. Question 4: Why did God give the law to the Jews? The law are the rules given by God to Moses in the book of Leviticus in the Old Testament. The Ten Commandments are a part of this, and I say just a part, because God gave Moses over 600 laws, and they were very specific, even as to who could enter the tabernacle of God, and what they had to wear. God at that time actually lived with the Jews, and no one was allowed to enter the tabernacle when God was there. Anyway, that Bible Study is for another time, I just thought that it was an interesting tidbit of information. I was reading the Bible last year when we went to Israel, and that was one of the things that stuck when I was reading Leviticus. God has always been a merciful God. He showed mercy to Cain when he killed Able. mark upon Cain, lest any finding him should kill him. Not only did God let Cain live even though he murdered his brother because of jealousy, but he also protected him from anyone else killing him. I believe that showed mercy. The Jews lived under God’s grace before the law was given. It was about 2000 years from the time Adam and Eve sinned and were forced to leave the Garden of Eden until the time that Moses received the law. The first person stoned to death after the law was given was a man collecting sticks on the Sabbath, this may seem harsh to us today, but people were not to work on the Sabbath, and this was considered work. Once God gave the laws he wanted people to follow them. This is the Lord at work. He took an active involvement in dealing with people, but he did not speak or interact with people directly before Jesus. The law had two purposes: to show God’s standards of perfection, and to show that people can never achieve those standards. He was showing the Jews not to be self righteous, because no matter how good you are, you will never achieve perfection. Only through the grace of Jesus, can our sins be forgiven. People can not save themselves. that he is a debtor to do the whole law. The only hope for salvation is through Jesus. This is the end of today's Bible Study. I would love to hear your thoughts and questions on this Bible Study. Please comment below with anything that you think of .